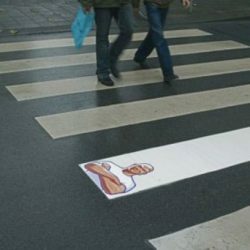 Guerrilla marketing is a marketing strategy that promotes a product or service in a unique and cost effective way. This kind of marketing is usually seen in public places, such as park benches, shopping malls as well as bus stops. When Guerrilla marketing is done right, it grabs the consumer’s attention right away and leaves an impression that then leads to “word of mouth”. It needs to take the consumer by surprise, if it doesn’t, it will go unnoticed. Many small businesses benefit from this kind of marketing because they don’t need to have a large budget, all they need is time and imagination. When small businesses use Guerrilla marketing it breaks them apart from big businesses using traditional forms of marketing that get lost in the crowd.